The Coastal Pearl, from the builder of the Coastal Living Show House in Rosemary Beach, greets you with its understated elegance and casual living. The gourmet kitchen is ideal for chefs who enjoy top notch appliances and spacious well-appointed kitchens. The open dining area is spacious with seating for 8 and four stools at the oversized marble kitchen island. The kitchen and dining are open to the comfortable family room. There are large flat screen TVs throughout the house with a media room/lounge on the second floor. Guests can access the SONOS music system to enjoy music from Pandora throughout the house. Families will enjoy the private walk out pool area for al fresco dining and poolside lounging. An outdoor grill is the perfect accessory for entertaining guests in this area. The pool is in an enclosed courtyard for maximum fun and privacy and has lush tropical landscaping and loungers to bask in the sun. Guests of this home are provided the use of 5 complimentary beach bikes (A $250 value). The bedrooms all offer high end luxury linens with comfortable mattresses for a great night's rest. The first floor provides a beautiful king suite (perfect for those with stair limitations). The second floor contains two additional beautifully decorated king bedrooms. The bunk room provides 4 built-in bunk beds with locker storage sure to delight the young people in your group! On the third floor, you will find a large resort-style suite with 2 queen beds, large closet, and a huge bathroom. The total sleeping space accommodates 14 guests. This home was decorated by Interior Designer Todd Bienz from Atlanta, who combines elegant coastal style with comfort and relaxation. We promise your family will not want to leave at the end of your vacation! This home is the perfect backdrop for a relaxing vacation that will be remembered for a lifetime! The Coastal Pearl is on the North side of 30A in Rosemary Beach adjacent to the fitness center and indoor sky pool. Beach access is an easy stroll or bike ride along a boardwalk to the 'C Rosemary Boardwalk' access and just a few houses away from the tennis courts. The Coastal Pearl was completed in Fall of 2013 and has since provided vacationers the "top-notch" vacation they deserve. 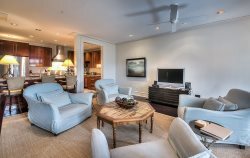 Staying in Rosemary Beach provides access to the fitness center and tennis club (for a fee), free use of the 4 stunning pools, and access to Rosemary Beach activities.